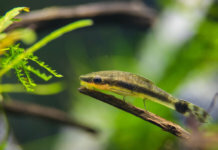 A canister filter has a lot of benefits to offer – it’s considered one of the best types of aquarium filters on the market. But how do canister filters work their magic? How does a canister filter work? Even if you’re completely new to aquariums, you’ve likely seen a canister filter. They come in different shapes and sizes and they’re installed beneath your aquarium. They usually look like a mini bin; consisting of a water chamber and filter media, and are connected to your aquarium via tubing. The water is drawn through a tube, pushed through the filter media which traps dirt, and finally, clean water is then pumped back into the tank. A canister filter can perform biological, mechanical and chemical water filtration, if equipped with the proper filtration media. Most canister filters come with a built-in water pump, which is necessary for. Some of them don’t, so you might have to get a pump separately. Regarding upkeep, canister filters must be cleaned once every few weeks, ideally once a month. What are the benefits of a canister filter? The amount of flow (gallons of water filtered per hour) is usually much larger in canister filters than in any other filter type. 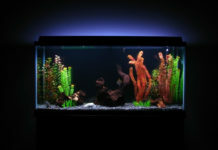 This is why they’re suitable for bigger tanks – they do the best job at cleaning large amounts of water at a fast rate. Despite this, the main benefit of the canister filter isn’t its flow power – it’s the size. They’re much larger than hang-on back filters or undergravel filters, allowing you to store more filtration media in their body. This not only means more beneficial bacteria within the nitrogen cycle, but also more layers of mechanical media that keep the water clean. Because of their design, they’re very subtle and can be hidden away, despite their size. What are the cons of a canister filter? The main downside to a canister filter is its price. In comparison to other filters, they’re often more pricey – regardless of brand. They’re also a bit more difficult to maintain; while a power filter can be cleaned within minutes, monthly maintenance of a canister filter usually lasts an hour or so. It must be taken apart and the media has to be either thoroughly cleaned or replaced. Even though it’s handy that the canister filter saves you space because of its external installation, if leaking occurs, the water will almost definitely end up on your floor. When should I buy a canister filter? Most canister filters are designed to clean large volumes of water at a fast rate. It’s suitable for all types of tanks, primarily large ones. If your tank can hold under 30 gallons, a power filter will do the job just fine. But if your tank is larger and/or heavily stocked with fish, you should definitely get a canister filter. Their flow rates can conduct complete water circulation and cleaning multiple times an hour. Previous articleCan Male And Female Betta Fish Live Together? Next articleUndergravel Filter VS Power Filter – Which Is Better For Your Aquarium? 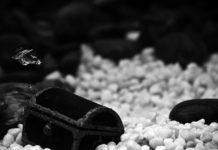 Undergravel Filter VS Power Filter – Which Is Better For Your Aquarium?